President Donald Trump made close to a million people susceptible to deportation by ending Deferred Action for Childhood Arrivals, otherwise known as DACA, with a six-month delay. Only four years ago, 800,000 undocumented immigrants who were brought to the U.S. as children­— otherwise known as Dreamers— made the risky decision to trust the federal government with their personal information to obtain DACA status. In February, Donald Trump seemed to welcome the 800,000 by stating that he would “deal with DACA with heart.” In September, he betrayed them. Trump’s choice of ending DACA but also giving Congress six months to take action on the future of Dreamers allows him to appease his voter base while giving himself a false sense of a clean conscience. Former President Barack Obama used executive action to establish DACA on behalf of these individuals after Congress failed to pass the Dream Act, a bipartisan bill that offered them a path to permanent residency. 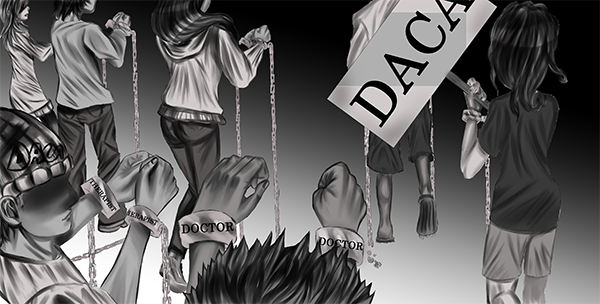 DACA did not offer a path to legal status, but instead allowed undocumented immigrants who were brought to the United States before the age of 16 to have the opportunity to obtain renewable two-year work permits if they have no criminal records and held high school diplomas or were working to obtain them. Nearly three-quarters of DACA applicants have lived in the United States for at least 10 years and nearly one-third were age 5 or younger at arrival, according to the U.S. Citizenship and Immigration Services. Trump made his decision knowing there is a high chance Dreamers will have to draw back into the shadows. The Dream Act has been proposed since 2001 yet has made little progress in Congress. Six months is too short of a time period to pass any significant legislation to secure the future of Dreamers in the only country they have ever known. Dreamers know this. We recommend that Congress act immediately to pass the Dream Act. The 800,000 enrolled in DACA and other young people like them deserve green cards and a path to permanent residency and possibly citizenship. Dreamers make up some of the most promising to chase the America dream. According to the Center of American Progress, about 90 percent are employed and 72 percent are seeking higher education. If Congress does not act within six months, the U.S. could lose close to $460 billion in GDP in the next 10 years without DACA recipients. Immigration reform has always been complex, but “sending them back” is not feasible. Dreamers offer too much to the country they call their home to be sent to foreign lands, where they know no one and may not even speak the language. This decision of keeping or deporting young people who came here unlawfully as children through no fault of their own demands for America to reflect on compassion and empathy. It is asking Congress to act immediately and pass a bipartisan bill that grants these individuals a pathway to legal status so they can be neighbors, classmates and friends.